Adam West as Batman in the 1966 tv show, otherwise known as our hero. This is the costume that I am completing for my husband as his anniversary gift….and the work begins! I am starting with the gloves. Chuck cast up the fiberglass shell for his cowl( headpiece/mask) today while I was out of the house. A courtesy to me because of the toxic nature of casting fiberglass. It makes me glad I sew..right? I realize this isn’t a very good picture of the gloves because of the shadows, but its getting late, and it will work for our purposes here. These are the gloves today! This pair of screen used gloves now owned by Mark Hardeman are characteristic of the aging of this particular stretch satin. They have faded in color of course, and all of the elasticity is gone from the fabric. The gathering you see at the top edge of the glove is not from elastic but twill tape which was used to stay the top edge. Its done its job very well…but the fabric has now relaxed around it. My key task is to replicate the fins. Notice how nice those points look? Its trickier than it looks let me tell you…. This set of gloves are Chucks, made from the same fabric as the original. This pair was made by Dorothy Gaspar she has the original pattern as used for the show. 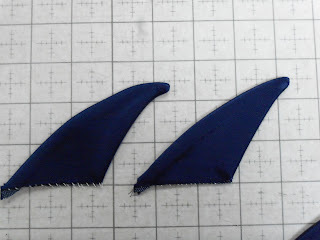 Chuck asks her to sew them to this point so that I can custom fit them to him and make the fins and set them to his exacting standards. 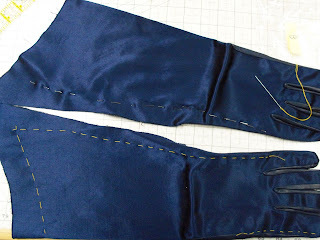 After pin fitting them I thread traced the finished outside seam line, and finished length. That’s the easy part because Dorothy did the difficult task of sewing the thumb and fingers. Or so I thought…. as getting the tips of these fins correct is touchy. You do not want to end up with a ball at the end, or with a hook as you can see the one on the left is doing. After some trial and error the solutions is in the exact placement of the crossgrain(stretch) to the lengthwise grainline(non-stretch). When placed correctly you get the correct shape as seen on the right. Now that I have that figured out I can make 5 more. but maybe tomorrow. Did you watch the show as a kid? Are you Batman, Robin, or perchance a famous villain?